Todd Rundgren rescued Halfnelson by getting a contract for Bearsville label and produced their self-titled 1971 debut. Halfnelson/Sparks album was one of Todd Rundgren's first outside production jobs since his own group, Nazz, and the job was excellent. Todd Rundgren was a producer who had a reputation for imposing his own sound/aesthetic on the musicians with whom he worked, but, basically, that first album is exactly like the demos Halfnelson made, even though the sound quality was enhanced. Todd Rundgren let the band do what it want and didn't tamper with things the way record companies do now. Todd Rundgren liked the material enough to sit back and encourage Ron Mael, Russell Mael, Earle Mankey, Jim Mankey & Harley Feinstein to do their own thing. Nevertheless lots of harmonies Todd Rundgren opted for were rejected by the band with cries of "slick ballads!". Todd Rundgren had a really casual manner about him. When Todd Rundgren was enjoying what the band was doing he'd walk around the studio with a drumstick up each nostril... 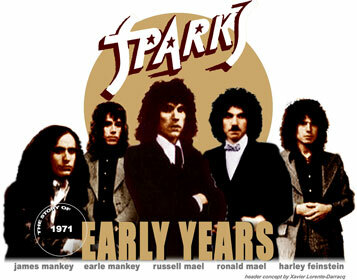 But in retrospect Sparks was not all that happy with his production and one year later Ron Mael said to Constant Meijers from Aloha Magazine (Netherlands) : "Todd Rundgren is extremely nice, but if you had to work with him, you wouldn't have much space for your own ideas. We did not feel his way of producing was suitable for our music. However, he could not be convinced otherwise. We started to behave a bit nasty and aggressive towards him and finally he didn't turn up anymore." Russell Mael's "Roger" and "Saccarin And The War" were re-vamped from the Halfnelson's demo tape and these two oddest tunes presented him as a shadowed force in the more lunatic aspects of the group. One song, "Big Bands", was in a early incarnation, a ditty called "Summer Days" which Russell Mael wrote and performed on tape for a school film project. Earle Mankey's "Biologie 2" brought a new sound to high school rock : no Wayne Kramer's MC 5 punkiness, but a scientific experiment in dubiously carnal terms. The female voice saying "Ooh, let's do it !" was the then first Mrs Mankey, Alisha. "Biologie 2" was the very first song the band heard airplayed on radio and was the only track from the Halfnelson album to appear on a Warner Bros loss leader sampler, "The Whole Burbank Catalogue" (Pro 512), compiled by Barry Hansen aka Dr Demento. 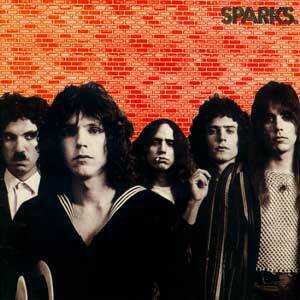 Nota : Most of informations regarding the Sparks' first Lp on this webpage were obtained from The Rock Market Place Review by Joseph Fleury (Sparks manager in the 70's) printed into "2 Originals Of Sparks" booklet. Other ones came from a Mael's interview by Jim Wilson (www.mother-superior.com), Cd reissue booklet notes by Paul Lester of Uncut Magazine and Ruud Swart & Carl Van Breukelen's Sparks Fan Mael website.